St. Columba and T. S. Eliot, St. Hilda of Whitby and the Australian writer Robert Dessaix are all part of a rich interweaving of people and places, historical and current, who became part of Roslin St. Clair’s journey during this 1998 six week Celtic and Anglo-Saxon pilgrimage through Britain and Ireland. 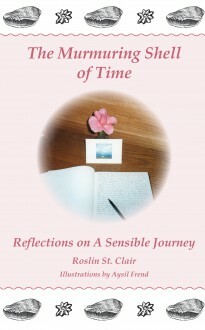 The Murmuring Shell of Time is a story of transformation, told both as an interior reflection and an external travel memoir. It examines our concepts of time, some of the less well known faces of love, together with thoughts on privacy, secrets and betrayal, longing and steadfast faith. The telling is lively and engaging – worth savouring slowly and then returning to for further insights and delight.